It's often said these days that the best possible form of advertising is to have something 'go viral' on the internet, ensuring that it's talked about and celebrated across discussion forums without any extra work needing to be done. It's also said that nobody knows how to make this happen. This is not quite true. There's a lot you can do to raise the profile of your business on social networking sites and they can be massively important in generating sales. You just need to know how. Despite what you may hear, there is no one social network that's better than all the others. Some have more users than others and therefore offer you access to a larger market, but what matters most is how you personally click with them. Contributions that seem forced or awkward won't work. Before you post professionally, create personal accounts on different networks - using pseudonyms if you prefer - and spend some time there getting a feel for them. Posting on every major social network can be prohibitively time consuming so it's better to choose just two or three where you feel comfortable and concentrate on those. Although you can get software that enables you to post the same things to all your networks automatically, this is generally frowned upon, and it loses what's really important about this form of communication - the personal touch. With practice you'll find that you can write quick messages tailored for each. Once you join a network it's time to start looking for subgroups within it that focus on fashion. Most social networks have dozens of these so, again, you would only exhaust yourself if you tried to interact with all of them. Instead spend some time working out which will be best for your business. Factors to consider are the size and activity level of a group, its relevance to the type of clothes you produce, and how well you can get on with other posters there. 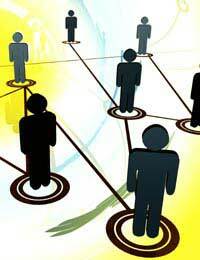 Social networking is sometimes presented as an easy way to promote your business. This isn't true - at least not in terms of the time you will have to devote to it. Fortunately it is something which is usually easy to fit in around other activities. If you have a shop, for instance, you can keep a laptop beside your till and post when things are quiet. Alternatively you can set aside an hour in the evening to catch up with your networks. You will only be able to establish yourself on social networks if you can keep up a regular presence. The easiest way to do this is to decide on regular subjects to post about. You should choose these to fit in with what's generally accepted on the networks you use. Examples might include announcing new collections, announcing discounts and offers, or talking in an informal way about exciting new fabric you've found and what you hope to do with it. Success on social networks comes from developing good, positive relationships with other users, who will in turn raise your profile with more. This means that it's worth taking the time to pay personal attention to people, for instance by offering words of comfort when they are unhappy or advising them on fashion choices. Praising other people's designs on occasion will make people see you as a friendly person rather than just somebody who is there to sell things. When you are seen as part of the community, people will be more likely to recommend your work. You can make people in your networks feel special by making them first in line for special offers and promotions, or by giving them the first chance to see new designs. You can also use your networks to help you source contractors, photographers and models, though you should do this cautiously, as there are a lot of untalented people out there recommending each other. Many popular social networks offer paid-for advertising packages that can let you target your particular demographic with great precision. There is, however, lots of other advertising you can do for free. The trick is to use your social networks to help you get to know your market at a social level. When you know what kind of imagery, humour and music they like, and what in-jokes they enjoy sharing, you can design advertising that will be warmly received and passed around. Social networking is a great way to boost your business as it can help you make contacts at all levels and it gives you the chance to pitch your work much more effectively. Just don't let it distract you too much from the really important work - running your business.